Scientists from Korea Advanced Institute of Science and Technology have developed a semiconductor chip which is known as CNNP (CNN Processor). This chip can run AI algorithm with ultra-low power. Using this processor, they have also developed a face recognition system known as ‘K-eye’. There is been a significant development in the field of AI in the recent times. But the capability of most of the AI software’s gets limited by the use of inefficient hardware. This is the main reason that all the big companies are investing the huge sum of money in developing semiconductor chips that can operate at low power. K-eye system comes in two types one wearable one and the one in dongle form. The wearable one can be used with a smartphone via Bluetooth. The device is capable of operating for more than 24 hours. The users can easily check the information about the other people using their smartphone or smartwatch which in turn fetches the result from the database. On the other hand, the smartphone with the K-eyeQ (the dongle version) can recognize and share information about users at any time. The smartphone automatically unlocks by detecting the authenticated user’s face. This eliminates the need for the password, fingerprint or iris scanner. But, you must be thinking that you can fool this technology by using the photo of the authenticated person. But, the company has taken care of this thing on their device. The smartphone can detect that the input face id coming from the saved photograph or a real person. K-eye system detects the face first and then it recognizes it. The company has proposed two technologies to maintain “Always On” feature with low power consumption (less than 1mW). The first one uses the “Always On” image sensor to determine if there is a face in its camera range. If there exists, it captures the frame and set the device to operate when a face exist which reduces the power consumption. 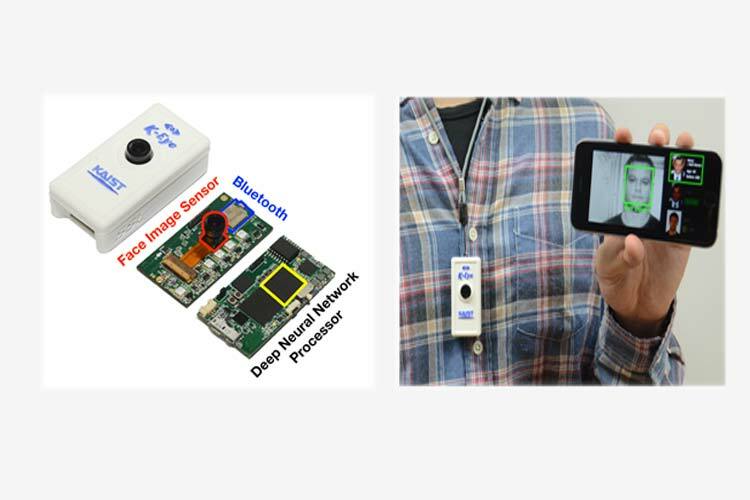 In this approach, the analog processor is combined with CMOS image sensor array that distinguishes the background area from the area that is likely to have the face. The digital processor then detects the face in only that particular area. This makes the device effective in terms of frame capture, memory usage, face detecting processing. The second method of achieving low power is by optimizing a convolution neural network in the areas of circuitry, architecture, and algorithm. The chip reads the data in both horizontal and vertical direction. It has the computation power with 1024 multipliers and accumulators working in parallel. The chips are capable of directly transferring the temporal result to each other. Using these methods CNNP achieved 97% accuracy with the power consumption of 1/5000 power of GPU.